I’ve somehow let this summer slip by without baking much with local fruit. All the blueberries went into bowls with chunks of cantaloupe instead of being added to muffins or pancakes or turnovers. 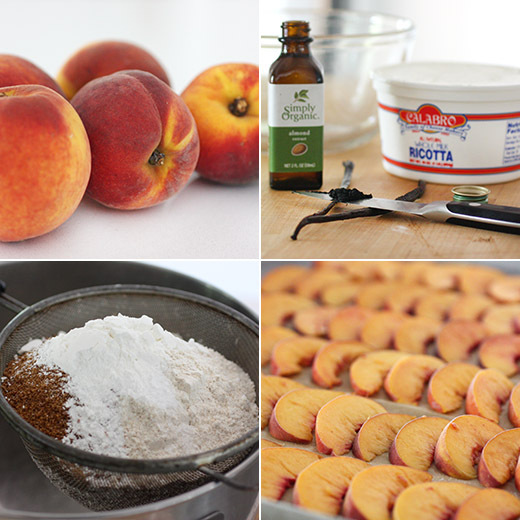 So, I was determined to do some baking with peaches before they’re gone for the year. I had extra motivation when I received a sample of Chameleon Cold Brew Texas Pecan Coffee. I’ve been a fan of this locally made cold brew coffee for years, and I couldn’t wait to try their new pecan flavor. The coffee is made with 100 percent organic, Fair Trade Arabica coffee and Texas Hill County limestone-cured water, and there is no added sugar in the flavored varieties. My plan was to whip up a breakfast full of Texas flavors with something deliciously peachy to go with this pecan coffee. I knew just what I wanted to bake. When I first mentioned the book Little Flower Baking I gushed a bit about how many recipes I wanted to try, and the Peach Ricotta Scones was one of them. They’re made with peaches mixed into the scone dough and an extra slice of peach of top of each one. And, the dollop of flavored ricotta on top was a revelation in scone-making. I’ve made just about every kind of scone there is from sweet to savory; with cream or buttermilk; cut into squares, circles, and triangles. But, this was the first time I’ve topped them with ricotta. Of course, I have opinions about making scones too. Here, the peaches were to be sliced and frozen before being mixed into the dough. That makes sense because peaches are very juicy and wouldn’t mix well into the dough after just being cut. However, next time I’ll cut the peaches into chunks rather than slices. The slices were a little too big to incorporate easily. Also, I usually mix the dough by hand rather than in a stand mixer. In the mixer, the dough can quickly become overworked, and the peaches broke and didn’t mix in as nicely as they would have by hand. To start, I used a mix of all-purpose flour and whole wheat pastry flour combined with a little sugar, salt, and baking powder. Chilled, cubed butter was added to the flour mixture in a stand mixer and mixed until crumbly. Cream was added while mixing until the dough came together, and the frozen peach slices were added. The dough was transferred to a work surface and patted into a thick square before being cut into squares. The squares were placed on a baking sheet, and each was pressed on top to form an indentation for the ricotta. Whole-milk ricotta was mixed with vanilla bean seeds, a little sugar, and almond extract. 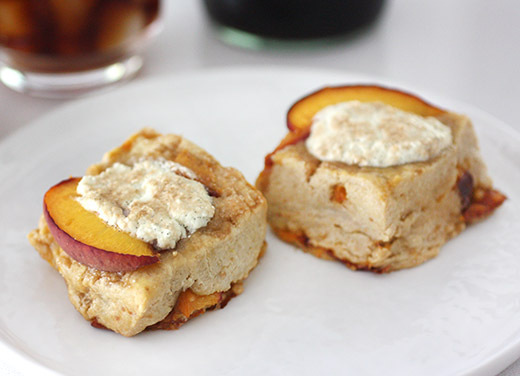 A tablespoon of the ricotta mixture was placed in the indentations in the scones, and an extra slice of peach was placed next to the ricotta on each one. The baking sheet then went into the freezer for an hour before being baked. Although I would make a couple of minor changes to the process next time, I wouldn’t change a thing about adding vanilla seeds and almond extract to ricotta and spooning it onto scones. I highly recommend trying that. Also, the freezing step before baking was essential. The ricotta firms up and stays in place well after being well chilled. And, the mix of Texas flavors with the cold brew pecan coffee? 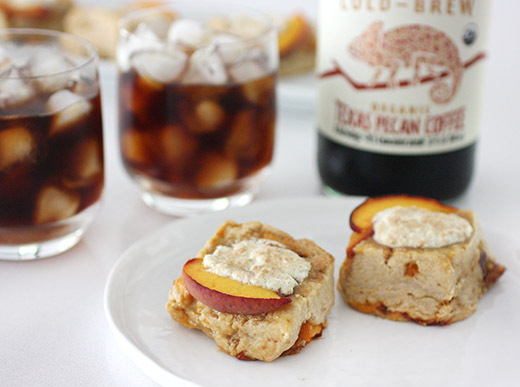 The nutty, smooth, nicely cold coffee was exactly right with peach scones. Very tempting! A heavenly combination. Summery and very delicious with the combo of my favourite stone fruit and ricotta. Love peaches! Our local ones haven't been quite as good as they often are, alas. Maybe the best are still to come. :-) Anyway, this looks great -- thanks! I love how these are almost like peach shortcake. And how interesting about freezing the peaches beforehand. That's a nifty trick. I love stone fruits ! Like you, I've made all iterations of scones! But this ricotta topping sounds fabulous! Hope you have a terrific week, Lisa! I'm with you, Lisa. I LOVE scones! These are so unusual...and they look perfection. What a clever idea the ricotta is. Peaches are a favorite...can't wait to try...my mouth is watering and I so wish these were in the kitchen right now! i've only just begun my foray into scone-making, so i've never used ricotta in any way. LOVE peaches, though, and am eager to give this combo a try!